I’m on my fourth listen of the freshly released Radiohead album, “The King of Limbs” and I have to say it’s completely different to me. Radiohead popped out doozy earlier this week announcing the album for sale on pre-order. They double-doozyed today by releasing the digital download portion a day early. So I paid my dues, which was different from “In Rainbows,” and downloaded the album. So far, the album branches out two ways for me. My work setup is a typical one, complete with standard issue headphones. You know, the kind that come with sound cards so you can chat while playing games online. That’s right, crap headphones. So while taking in Radiohead’s latest, a couple of songs jumped right out at me. The single, or at least the one that has a video (obligatory YouTube link below), ‘Lotus Flower’ comes off as the grooviest song on the album. I felt the pulsating thumps throughout the song and enjoyed Thom Yorke dancing away oh so goofily. The other two songs I dug was ‘Give Up The Ghost’ and ‘Codex’. Both come across as serene ballads. The piano work on acoustic guitar work help only to bring out Thom’s wailing voice even more. The decisions in progressions there were just off the kilter enough to keep me guessing, while pulling some familiar strings inside. All three of the songs made me check the song list each play to get the names down. Now it’s almost midnight and I decided to give another listen. The major difference? My stereo attacking me from both sides. I can hear some of the more delicate and hidden sounds while feeling the thumps that I was supposed to earlier on. Okay, so I know how the album must be played. That’s probably why I opted for the mega-nerd pack and dropped some coin for the vinyl record/compact disc mega edition. So what songs hit me just now? ‘Little by Little’ laid a better foundation of continuous clips and mini drum hits that I missed earlier on. The tiny electronic noises made me way more anxious than earlier. It was like they were tyring to push me along in some direction that I wasn’t ready to take. The other song that made stereo sense was ‘Bloom.’ ‘Bloom’ does its job as an opening song right about when Thom sang ‘open your mouth wide.’ It was easier for me to get lost in this one and set the tone for rest of the short albums work. 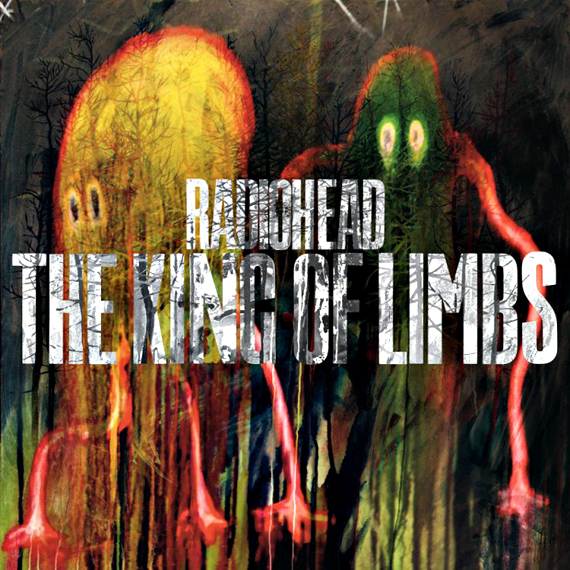 “The King of Limbs” is great effort by Radiohead. The problem with Radiohead is that they somehow have a stranglehold on both the mainstream and underground. They are expected to blow minds every time they deliver new tunes. As with each new tunes, comes higher expectation. Maybe that’s why the hit and run people with new music. Maybe they are trying to avoid the hype killer. When compared to earlier works, “The King of Limbs” is not as life altering. It’s certainly not as complete as “OK Computer” or as revolutionary as “Kid A” or “In Rainbows.” What it does do is deliver a new set of songs to meticulously pick apart and unravel to discover something new each listen. That’s more than what most bands can hope for. The hype still looms, however and I’m calling this round a draw.